While at E3, I wanted to try one of Sony's 3D games and I wanted to try the Move. Because I am just that efficient, I decided to achieve both goals at the same time by playing The Fight: Lights Out. I came away impressed by the technology but wishing my feet didn't have to be glued to the floor. 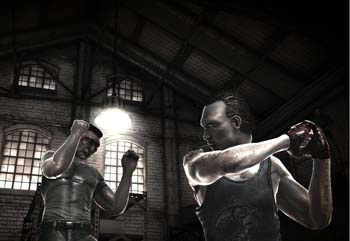 As you might have guessed from its name, The Fight is a game in which you take on the role of a pugilist making his way through the underground fighting circuit, beating your way through 12 different venues and bosses. Each venue has a certain number of challenges, and defeating bosses unlocks finishing moves to put a bit more flair in your pugilism. Taking a trip to the gym will increase your fighter's stats, making him stronger or faster, and winning matches earns you money that you'll need to get treated by the local doctor, but fighting dirty - say by throwing an elbow - will cut into your winnings. You can play online, and, interestingly, can not only watch other fighters in action, but also bet on the outcome. To play, you put a Move controller in each hand and swing at your opponent the way you would in a real fight. I did a whole bunch of jab/cross/upper combos and was pleasantly surprised by how responsive the game was, and the finishing moves had a lot of style. The one frustrating feature was the fact that once the game is calibrated to your head and hands, you can't move your feet, which is irksome enough for a regular game, but even more aggravating when you're simulating an activity that naturally includes shuffling around. As good as my top half felt throwing punches, my bottom half felt completely awkward and stiff because I had to remain fixed in place. I understand the tradeoff being made - the calibration really is spot on - but it ruined much of the experience for me. The 3D was impressive, too, once the glasses were working properly. It took a few rounds of turning them on and off, but eventually they decided to play nice and I got to see The Fight in all its multidimensional glory. It took a little while to get used to the depth - I kept swinging into empty air when my opponent backed away - but once I did it made the experience feel just that bit more genuine. As a glasses-wearing person, I don't think I could stand to play for long stretches with double-specs, but that's not the game's fault. The Fight: Lights Out didn't really do anything wrong, but it didn't blow me away, either. It hits all the items on the fighting game checklist - customizable fighter, plenty of opponents, unlockable moves - but left me feeling a bit flat. To be perfectly fair to Lights Out, my attention was on the technology far more than the game, and I only got to play through a few fights. But I'm not sure I want to, really. Let me move my feet and we'll talk.